Operable in stand-alone mode or DMX interface. DMX512 control possible via any commercial DMX controller (occupies 5 channels). 3 or 5 DMX channels selectable for numerous applications. Sound-control via built-in microphone. Adjustable microphone sensitivity via LED display. Comfortable addressing and setting via control panel with LED display and three operating buttons. Functions: static colors, RGB color blend, internal programs, dimmer and strobe settings via DMX, Master/Slave . Equipped with 18 x 3W tri-color LEDs. Through the close chip placement of the multichip technology, an exquisite color blend, even with short distances to the illuminated surface, is guaranteed. Beam angle approximately 25°. Locking possibility at the mounting bracket. Ready for connection with power cord and safety plug. Available in alu and black. 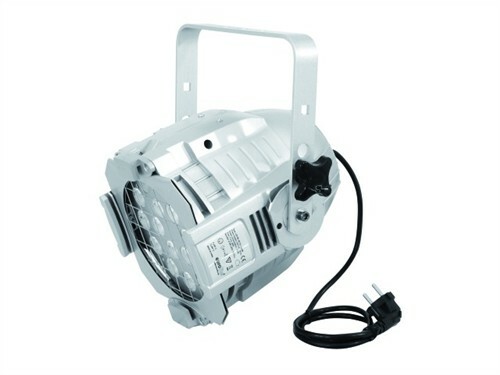 Advantages of high-power LED technology: extreme light output, long life, low power consumption, defacto maintenance free with brilliant light radiation.